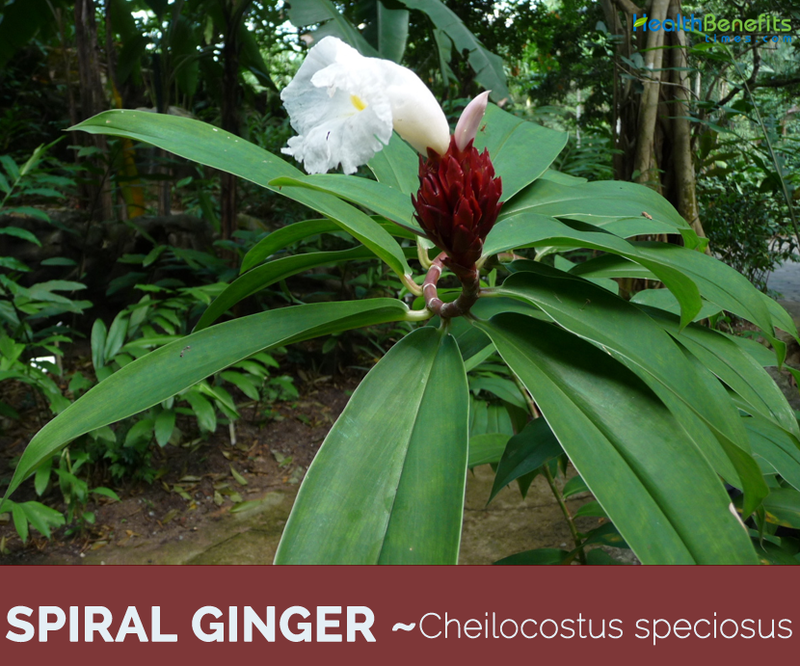 Cheilocostus speciosus commonly known as Spiral Ginger, Cane reed, crepe-ginger, crape ginger, Malay ginger, spiral flag, wild- ginger, variegated ginger and costus is an important medicinal and ornamental plant belonging to genus Cheilocostus and Costaceae (Zingiberaceae) family. The plant is native to Southeast Asia and surrounding regions, from India to China to Queensland. It is especially common on the Greater Sunda Islands in Indonesia. It is also supposedly naturalized in Mauritius, Réunion, Fiji, Hawaii, Costa Rica, Belize, Melanesia, Micronesia, and the West Indies. 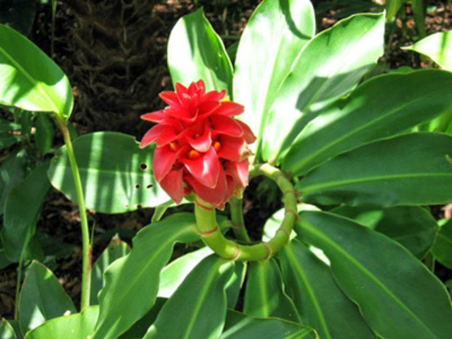 The genus name of Spiral Ginger “Cheilocostus speciosus” is derived from the Greek term Cheilo means lip, referring to its large labellum. The species epithet speciosus in Latin means good looking, beautiful, handsome, and impressive, describing its appearance. Cheilocostus speciosus differs from the common ginger by having only one row of spirally arranged leaves. The species reproduces vegetatively by rhizome, and birds scatter the seeds when they feed on the fruits. The plant is cultivated in India for its medicinal uses, and is cultivated elsewhere as an ornamental. 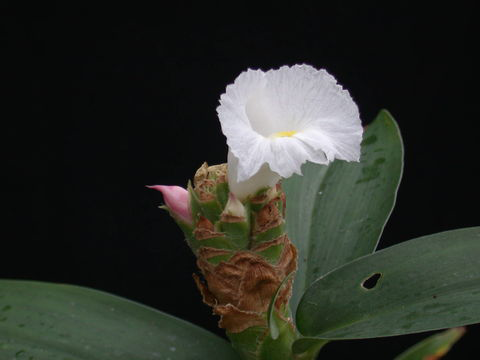 In some areas Cheilocostus speciosus is introduced and has become an invasive species. It is widely cultivated as an ornamental. Spiral Ginger is an erect, evergreen, ornamental herbaceous and succulent perennial herb that grows about 6-10 feet (2-3m) tall. The plant is found growing abundantly near forest margins, moist places in valleys and roadsides. The plant prefers fertile or humus-enriched and well-drained soil. 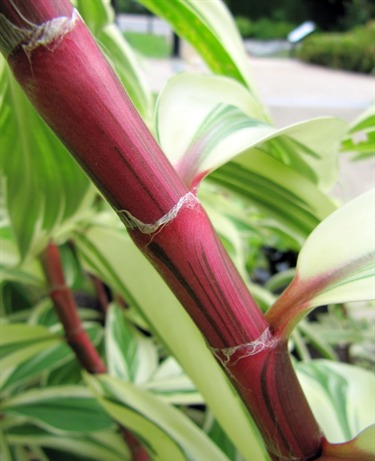 The cane-like stems emerge from underground rhizomes and are upright, unbranched, and green to dark red in color. Dried rhizome is curved or somewhat straight, cylindrical, branched piece, 10-30 cm in length and 3-5 cm in diameter in dried condition, upper surface marked with circular nodal scars with remnants of leaf bases, lower and lateral surfaces exhibit small circular scars of roots or few wiry rootlets fracture fibrous and fractured surface is yellowish brown. No characteristic taste or odor. 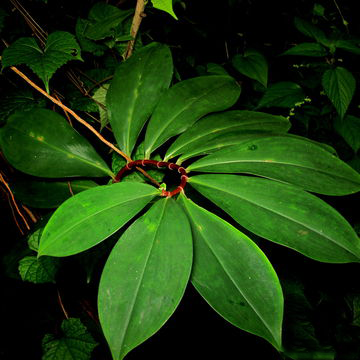 Sub sessile green leaves are simple and entire, elliptic to oblong or oblong-lanceolate, 15-30 cm long or more, about 4-6.4 cm wide, and with pointed tip, glabrous above and silky pubescent beneath and sheathing at the base and are spirally arranged along the stems, giving its foliage a dense appealing appearance. More dramatic are its snowy-white flowers. Each stem will produce a dark red or brownish-red pinecone-like terminal inflorescence, where large and showy flowers, usually 3-4 at a time, emerge from the ovate bracts. 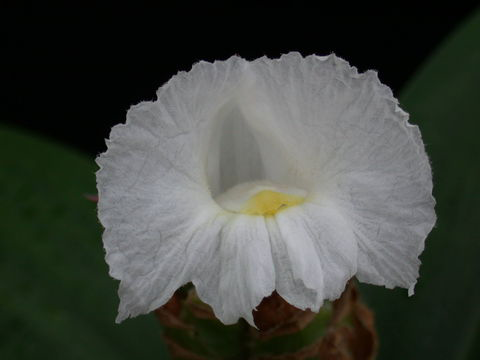 Each trumpet-shaped, frilly and crepe-like white flower, up to 4 inch (10 cm) in diameter, has fused petals forming a large petaloid labellum and exposing a tiny, yellow, petal-like stamen with reflexed tip at the opening of the floral tube. The flowers are followed eventually by roundish to ovoid, red 3-angled fruit capsules, 1.5 cm across, containing black seeds and white flesh that are favored by birds. Rhizome has been used to treat fever, rash, asthma, bronchitis, and intestinal worms. Sap of young leaves and stems can be taken internally for diarrhea, for ear infections and eye infections. It can be used to treat coughs and colds, congestion of the nose and lungs, and internal parasites. It can also be used externally to treat skin infections. Juice of the rhizome is used as a purgative in Malaysia. An extract of the rhizome can be used to lower blood sugar levels, to treat inflammation of the liver, to fight stress, and as an antioxidant. It also increased uterine contractions making it a useful birthing aid where contractions are insufficient. Juice of stems used for dysentery. 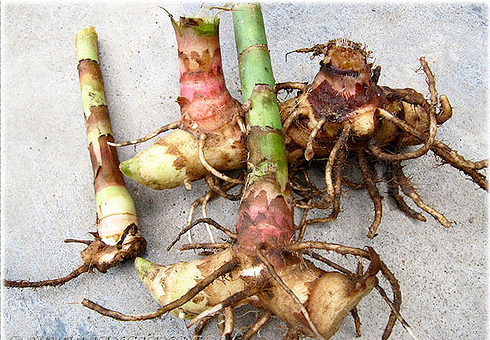 Rhizome has been used for diabetes, fevers, asthma, bronchitis, intestinal worms, and rashes. Roots used for catarrhal fevers, coughs, dyspepsia, worms and skin diseases. Dried or fresh material decoction may be used as external application for nettle rash. It is used in the treatment of diabetes in Bangladesh. In Assam, India used by the rural people for fertility control. It is used in the treatment of abdominal distension and pain, chest pains due to liver problems and jaundice, gall bladder pain, constipation, and asthma. It also stimulates the appetite. Root is used to treat bloating, irregular menstruation, pulmonary disorders, and wasting of muscle tissues in Tibetan medicines. Powder of the rhizome of Kebuka is given in a dose of 3-5 g with honey to treat cough and asthma. Powder of the rhizome is given in a dose of 3-5 g with hot water to treat indigestion and anorexia. Fresh juice of the rhizome of Cheilocostus speciosus is given to treat difficulty in labor and pai associated during labor. Paste of the leaves and rhizome is made into paste and applied locally over the skin affected with discoloration, black spots and itching due to ring worm infections. 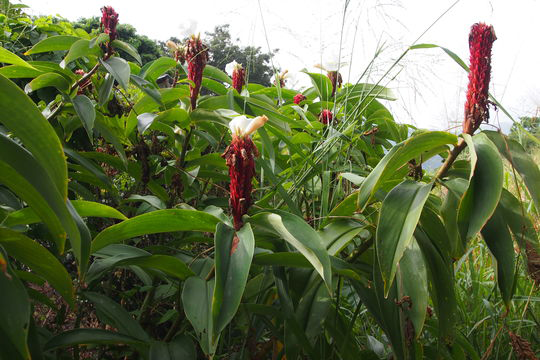 Decoction of the rhizome of the Cheilocostus speciosus is given in a dose of 20-25 ml in condition of elephantiasis, fever and intestinal worms. Cold infusions of the rhizome of Kebuka acts like blood purifier and hence beneficial for patient suffering from repeated skin diseases. Juice of rhizome is applied to head for cooling and relief from head-ache. Bruised leaves are applied in fever. Decoction of stem is used in fever and dysentery. Patients with high fever mostly utilize leaf infusion or decoction as a sudorific or in a bath. Sap from leaves, young stems are used against diarrhea, cough, cuts, wounds, scabies, antidote for snake bite, jaundice, arthritis, burning sensation, constipation, leprosy, skin diseases, asthma, bronchitis, inflammations, anemia, intestinal warms, worm infection, rash, nose pain, to stop vomiting, spermatorrhoea. 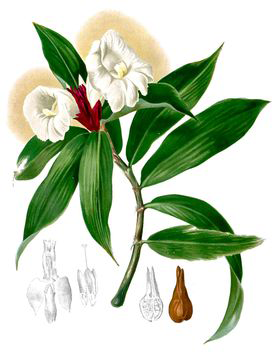 Rhizomes of Costus speciosus are bitter, astringent, acrid, cooling, aphrodisiac, purgative, anthelminthic, depurative, febrifuge, expectorant, tonic. Rhizomes are also given in pneumonia, rheumatism, dropsy, urinary diseases, jaundice, and leaves are given in mental disorders. Plant is also used for eye and ear infections. Leaf used as liniment to relieve soreness and irritation. Leaves are used topically over wounds and ulcers and the stem is recommended for treatment of burns. Rhizome is commonly used to treat dropsy, carbunacles and gonorrhea. Nepalese and Indian used it to stop hiccoughs, asthma, bronchitis, and colds. Rhizome forms part of the remedy for liver cirrhosis, and the accompanying jaundice and ascites in Indonesia and China. Rhizome is considered an antidote and had been advocated for use especially in snakebites and other venomous bites. It is also used in cases of dog bites and the accompanying rabies. Stem crushed and stem sap used to relieve constipation, catarrh as well as toothache. Poultice made up from the stalks mixed with young leaf is used as hair wash to promote hair growth. Roots are used to treat catarrhal fever, cough, dyspepsia, skin problems, syphilis, tuberculosis, and menstrual problems. Roots are used in postnatal care and also considered a galactogogue in India. Roots are used to treat inflammatory conditions like rheumatism, lumbago and pain in the marrow in Nepal. It is also useful for infectious conditions like otitis externa, conjunctivitis, leprosy and other skin infections. To increase the production of urine and the elimination of waste substances, a decoction of 4 leaves and a piece of root of about 10 cm in 1 liter of water is made. 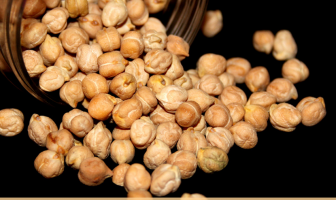 It develops an interesting anti-inflammatory action on the urinary organs. It is recommended for use in cases of nephritis, urinary stones and inflammation of the bladder (cystitis). To increase menstruation when it is scarce and to remove waste substances, a decoction of 4 leaves and a piece of root of about 10 cm in 1 liter of water is also made. To calm menstrual pain (dysmenorrhea), decoction of 4 leaves and a piece of root about 10 cm, and 4 poppy flowers in 1 liter of water. Take during the days of menstruation. In cases of urinary incontinence 6 leaves and 2 pieces of stem of about 10 cm each cooked in 1 liter of water, per day are used. For children it is the fourth or half the dose, for a week. For the urinary infections, a decoction of 4 leaves and a piece of root of about 10 cm in 1 liter of water is made. It is taken every day for a week. Take a piece of stem 1 m long, wash, crush, add 1 liter of boiling water, let it stand and drink each day for a week. It is mentioned in the Kama Sutra as an ingredient in a cosmetic to be used on the eyelashes to increase sexual attractiveness. 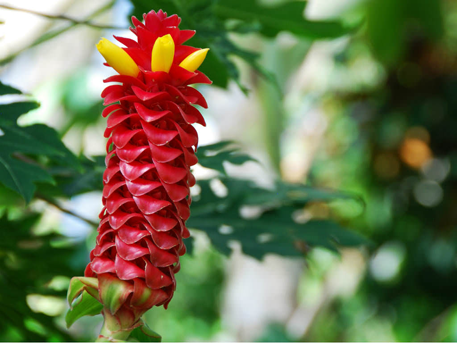 Spiral Ginger will make excellent ornamental specimens for the garden or landscape. They’ll be ideal as a tropical backdrop in perennial borders or as informal hedge and screen. Overdose of the rhizome or consuming fresh rhizome can lead to toxic symptoms of the gastrointestinal tract namely vomiting, diarrhea and giddiness. Raw/fresh rhizomes are considered poisonous. The flower buds are also edible, usually eaten fresh in salads or as a garnish.